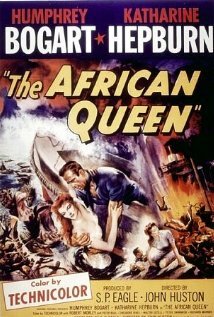 Noir at heart but filmed in Technicolor, The African Queen easily fits under Noir and Mod Movie Monday categories as it definitely deals with the darker side of humanity. Swing back to North Africa, 1914. News reaches a small German settlement that the Fatherland is at war. British missionaries are suddenly caught in the crossfire, and when Kathrine Hepburn’s character’s brother dies, she leaves the burning wreckage of her church with none other than alcoholic captain Bogie on his beat-up old jalopy of a steamer, The African Queen. Together they trek down a treacherous river full of all sorts of nasty things, including Germans with those funny little spikes sticking up out of their helmets. They catch wind that a German warship is anchored at the mouth of the river, and Hepburn does all she can (in the eyes of God) to sober up Bogie and get him to help her find a way to destroy the ship. One of Bogie’s finest roles, he is very convincing as a gin-swilling roughneck. That may have something to do with the fact that while they filmed this flick in the jungles of Africa, Humphrey Bogart and director John Huston stuck to a steady diet of baked beans, canned asparagus and Scotch whiskey. There was a method to their madness…they were the only two from the cast and crew that made it through filming without getting dysentery or malaria. This included Hepburn, who drank only water and had dysentery so bad they had to keep a bucket next to the camera. There is some great trivia on The African Queen at IMDB. Just as the ’58 Plymouth Fury was a character in Christine and the pimped-out Dunham Coach Eldorado was a character in Superfly, so was the little steamer The African Queen (I suppose this turn of the name was to indicate the double meaning, as Hepburn’s character also acted like the Queen of Africa). 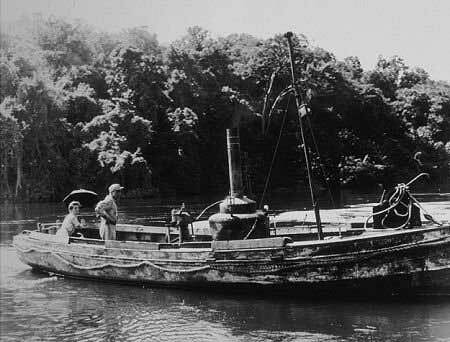 The boat had already been in actual service for 4o years when they used it for the film, and went on for many years after working hard along the river. 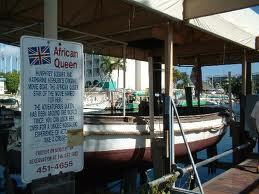 Today the boat is still in service…it’s docked in Key Largo, FL just off the Overseas Highway (US 1). It’s on display, looking very close to the way it did in the movie, and is available for charters. It’s really no where near as big as it looks in the movie. Kind of funny that it would end up in Key Largo, with Bogie’s connection to that island with his 1948 movie.